The result means coach Jupp Heynckes moves a step closer to emulating his feat of 2013, when he guided Bayern to a Champions League triumph. Javi Martinez and Steven N Zonzi compete for the ball. JUPP HEYNCKES’ BAYERN Munich marched into another Champions League semi-final on Wednesday despite 10-man Sevilla holding them to a goalless draw at home in Wednesday’s second leg. Bayern progressed to the last four of the competition for the seventh time in nine seasons as they prevailed 2-1 on aggregate following their first-leg victory in Spain last week. 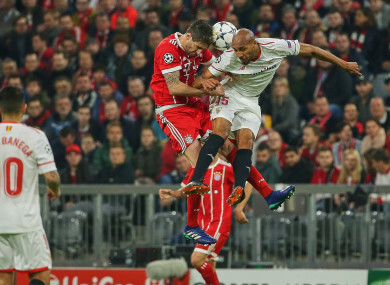 “Sevilla are a good team – for a long time we couldn’t get a grip on the midfield, but we stopped them scoring – that was important,” said Bayern winger Arjen Robben. Sevilla’s bid for a first semi-final appearance fell short in spite of shutting out Bayern’s attack and restricting the hosts to just 51 percent possession. “I’m proud of my team, they showed great personality and character against a very strong opponent, it wasn’t easy,” said Sevilla boss Vincenzo Montella. The Spaniards’ defence constantly thwarted Robert Lewandowski, who was unable to add to his 35 goals this season, although Bayern had twice as many shots on goal. Sevilla finished a man down after Joaquin Correa, who had earlier hit the crossbar, was sent off in the closing stages for a clumsy foul on Javi Martinez. After Barcelona and Manchester City — the runaway leaders in Spain and England respectively — crashed out on Tuesday, Bayern are the only team left in Europe who can still win the treble. They wrapped up a sixth straight Bundesliga title last Saturday and are into the semi-finals of the German Cup. Lewandowski endured a bruising night and Sevilla centre-back Gabriel Mercado was booked after just two minutes for bringing down the Poland international just outside the area. The Bayern striker then forced Sevilla goalkeeper David Soria to palm over the bar on seven minutes. Sevilla, needing to score at least two goals, started pushing forward themselves as Pablo Sarabia fired wide on a rare forage behind the Bayern defence. Franck Ribery wasted the best chance of the first half when he created space inside the area on 37 minutes only to fire straight at Soria, who punched away the Frenchman’s powerful drive. At the other end, Rafinha’s perfectly-timed tackle denied Sarabia, who was through on goal and shaping to shoot. Bayern again struggled to kill off Sevilla after the interval with Lewandowski nodding agonisingly wide from a deep Ribery cross. Soria produced another good save with his foot to block from James Rodriguez at his near post. Sevilla’s best chance came just shy of the hour mark when Argentine winger Correa hit the woodwork after connecting with a Jesus Navas free-kick, the ball bouncing to safety with Sven Ulreich well beaten. Robben then cut back inside with a trademark run that resulted in James’ shot being comfortably saved by Soria, as Bayern’s frustration at their inability to put Sevilla to bed grew. Lewandowski was replaced by Sandro Wagner on 77 minutes, the former departing sporting a plaster on his left cheek after several battering tussles with the Sevilla defence. Tempers flared late on when Correa was dismissed for clattering Martinez just before the final whistle. Bayern will learn their semi-final fate at Friday’s draw in Switzerland featuring defending champions Real Madrid, Liverpool and Roma. Email “Bayern Munich hold off Sevilla challenge to reach Champions League last four”. Feedback on “Bayern Munich hold off Sevilla challenge to reach Champions League last four”.